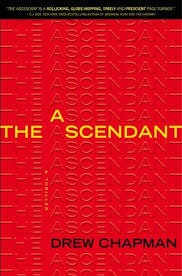 I received an Advance Reader’s Edition of The Ascendant, thanks to Goodreads. This is Drew Chapman’s debut novel, and it is also the first thriller of this nature that I’ve ever read! I found the book captivating and exciting. I felt that there was some unnecessary use of cuss words, but then again, this book probably isn’t meant to be read by a twelve-year old. Other than that, the book was amazing. The U.S cannot stop China, but they can retaliate with attacks of their own. China is hacking into Google, selling U.S stocks without permission, and attacking the U.S through other foolproof methods. The US government is having a hard time stopping them, and there is only one person who can. Garrett Reilly is a young man with the power to destroy a country. His ability to recognize patterns will give the military a huge advantage if he decides to help them. There’s only one problem. Ever since Garrett’s brother got killed in the military, Garrett has hated them. He wants nothing to do with the military. The military then hatches a plan, a plan of deceit and cunning lies to get Garret to help them. All will be lost if he figures it out. Meanwhile, China has got problems of its own. People in China are stirring up a rebellion, bigger than anyone could possibly imagine. The person leading them? The Tiger. Will Garret be able to help the government, win the war with China, and figure out the Tiger’s true identity?